BRS Aerospace’s current whole aircraft parachute system for fixed-wing aircraft design calls for a parachute ballistic launcher to be installed in the aircraft with either a pilot-initiated activator located in the cockpit or an automated activation system. Upon activation, a ballistic rocket propels a parachute into the airstream to slow the airplane and float it down into a survivable vertical landing. Transcend Air was founded in 2017 to unlock the heart of the city with a VTOL airline that will free business travelers from congestion on the ground and in the air. 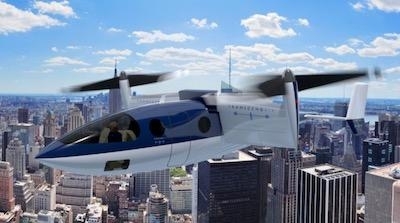 Having taken the unique path of designing an aircraft starting from a ticket price, Transcend has developed the Vy 400 as the best solution for city-center to city-center mobility (C2CM), with door-to-door prices lower than current air travel options, and door-to-door times that are 67% to 80% less. With the Vy 400, Transcend Air is finally realizing the VTOL promise.